The first attempt in the UK to evaluate the contribution of visual and performing arts in hospital settings. The authors describe a series of small-scale controlled studies in a variety of clinical settings in Chelsea and Westminster Hospital, drawing data from routine clinical assessments to minimise demands on staff and patients and to ensure ecological validity. The authors conclude that their findings show that ‘the integration of visual and performing arts into the health care environment induce psychological, physiological and biological outcomes which could have clinical significance’. Staricoff, R., Duncan, J., & Wright, M. (2002). 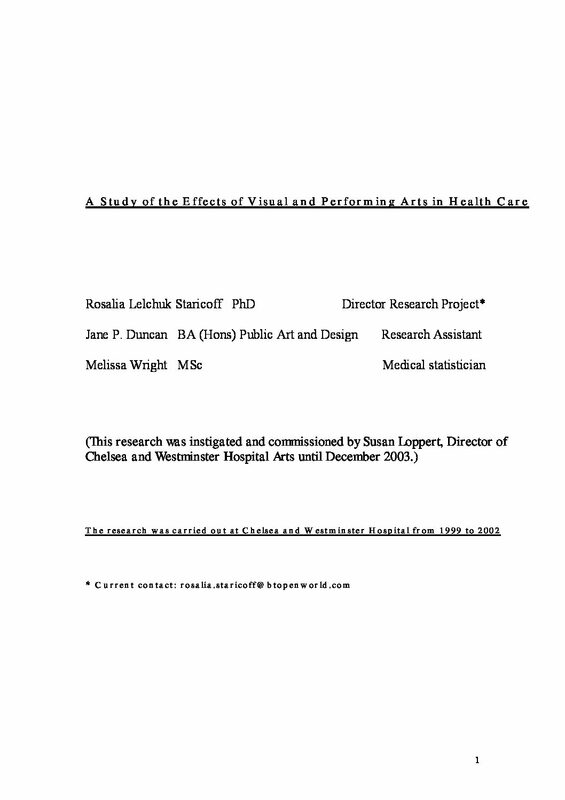 A study of the effects of visual and performing arts in health care. London: Chelsea and Westminster Hospital.